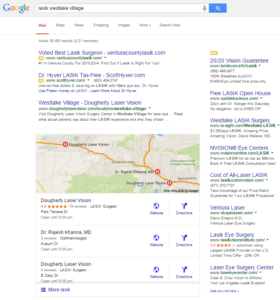 Google updates local search results for desktop and mobile searches. This week Google quietly rolled out an update to how their SERP (search engine results page) displays. What does this mean for local businesses? This will benefit some business more than others. If you were in the top three of local search results, you will benefit greatly since it seems Google is no longer showing more than 3 results on the page. Prior to yesterday, you would see as many as 9 results in local search results. You have less competition for searchers to click on. If you happen to be in position 4 or lower (position “D” for old results), you’re now removed from page 1 which will naturally lead to less visits and less leads. It’s safe to assume Google has analyzed the data of searchers behavior and determined the most important factors to searchers when using their search engine on a desktop computer. The information they display prominently is Reviews, Hours, Website, Category and Directions. Gone from the results page are the businesses full address, phone number and link to businesses Google Plus Pages. We have also noticed that Yelp listings have been pushed down from their previous placement. We found that more many searches, Yelp dominated the top half of the page, often having multiple organic results above local search, this will almost certainly impact the amount of visitors these pages receive. 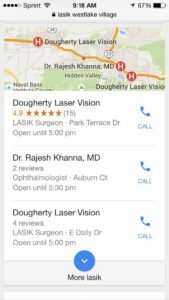 Just as Google has done with desktop, they customized the local results based on how mobile searchers use their search engine. Providing hours of the day, review rating and click to call. We find that mobile searchers when looking for a local business on mobile do so to find a phone number. As a local business owner, you need to pay attention to some key items with your business listing. Make sure you have a verified page, go to Google My Business if you haven’t already done so to manage your page. Reviews are display prominently on both mobile and desktop, get as many as possible. As with many changes Google makes, additional tweaks will take place to fine tune the result page based on data. If you have any questions about local search engine optimization, contact us.